A Europa League tie against 14th-placed Lech Poznan (in the 16 team Ekstraklasa) looked the perfect chance for Manchester City to get back on track after recent losses to Wolves and Arsenal, however the Polish champions didn’t appear to get the message, beating City 3-1 to put themselves top of Group A.
Lech Poznan lined up in a 4-2-3-1 as did Man City – although theirs was lopsided, with Adam Johnson playing higher and Shaun Wright-Phillips deeper than is customary. As well as straying from their usual 4-2-1-3 shape, they also played with wingers playing on their “right” side (right-footed on right; left-footed on left) rather than the inverted wingers we have come to expect from them. Presumably this was to take advantage of Emmanuel Adebayor’s height, but neither winger got many crosses in. It may well have been better inverting them for this opening period when all Man City did was hoof the ball long for Adebayor; his flick-ons could have been used for Johnson and Wright-Phillips to come inside and shoot, rather than them picking it up from him with no one to cross to. The wingers eventually switched sides around the 25 minute mark, but by then City had started to play possession football rather than their initial long-ball style. fig. 1 – Wright-Phillips drags left-back out of position for a diagonal run behind from Milner. As mentioned before though the wingers weren’t symmetrical: Wright-Philips was repeatedly coming short towards Micah Richards, dragging the left-back up the pitch for James Milner to make a diagonal run behind, then hitting it down the line (fig. 1). This move was repeated several times and Poznan were generally good at tracking Milner – this meant that he wasn’t getting decent crosses in for Adebayor but was winning corners. The public opinion seems to be that Wright-Phillips is rubbish because of his somewhat undeserved England appearances (Capello is overrating him so everyone else must underrate him) but he isn’t a bad player by any stretch of the imagination. For this game he was generally very good, taking up decent positions, especially when Wayne Bridge or Adebayor drifted, and doing a good defensive job. He did little on the ball but more often that not that was simply his teammates not giving him any options. On the opposite side Johnson was poor – early on he was repeatedly getting the ball standing about for a bit then passing it short backwards; there’s nothing wrong with short patient passing, but all he was doing here was gifting the opportunity for Poznan to get men back when he could be taking on a defender. Even once switched to the right side he is probably more accustomed to now, he didn’t fare much better. Usually he is able to provide width even when on his wrong foot, yet he was totally ineffective and so City struggled to create. Bridge and Richards were allowed to attack a lot more when the wingers were on their correct sides, but had limited effectiveness due to Johnson and Wright-Phillips taking up much of the space to run into. 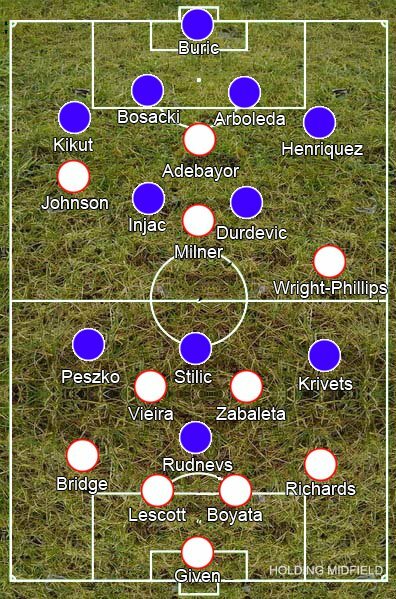 It seemed that Poznan’s wingers only really worked to defend against City’s full-backs once Johnson and Wright-Phillips switched round, realising that they would be City’s main outlet for width. 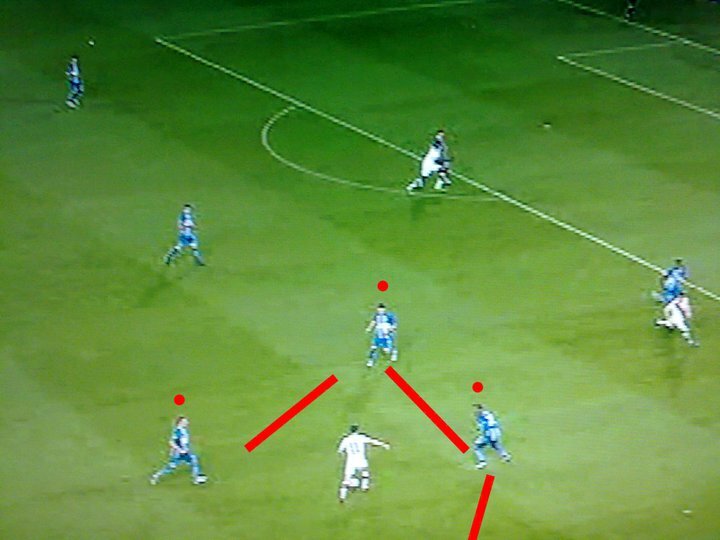 With the full-backs not pushing forward, the only width would come from the poor Johnson (fig.2). fig. 2 – Little City width other than poor Johnson. By blocking the full-backs’ runs Poznan also managed to split the back six from the front four, resulting in a lot of aimless passing between them then a long ball upfield that would gift possession to Poznan. Milner began to occassionally drop deeper to attempt a long incisive pass that would be easily cut out too. This is part of the problem of playing someone, the same could apply to Yaya Toure, whose talents don’t necessarily lie in their creativity in this position. This really is awful defending. The primary purpose of the double pivot is to stop space between the lines and there’s acres of it here. Their other main purpose is to help the full-backs but since they were always so far from the defensive line, they couldn’t, so Bridge and Richards were left isolated, unsuprisingly both were booked before half-time for silly fouls. 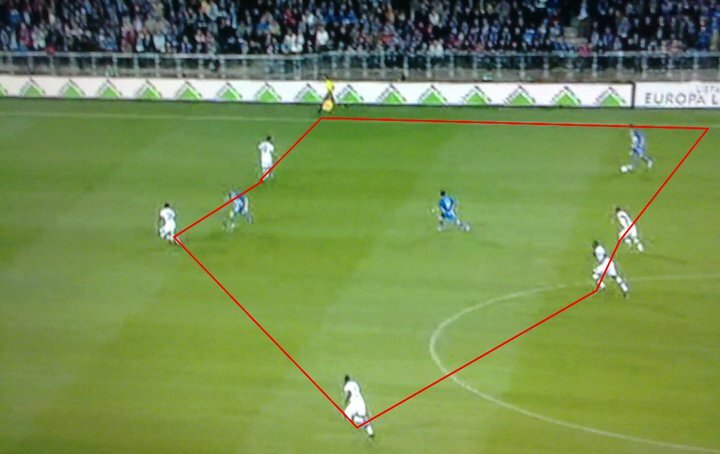 Poznan on the other hand were doubling, or sometimes tripling, up on City’s players all the time (fig. 3). 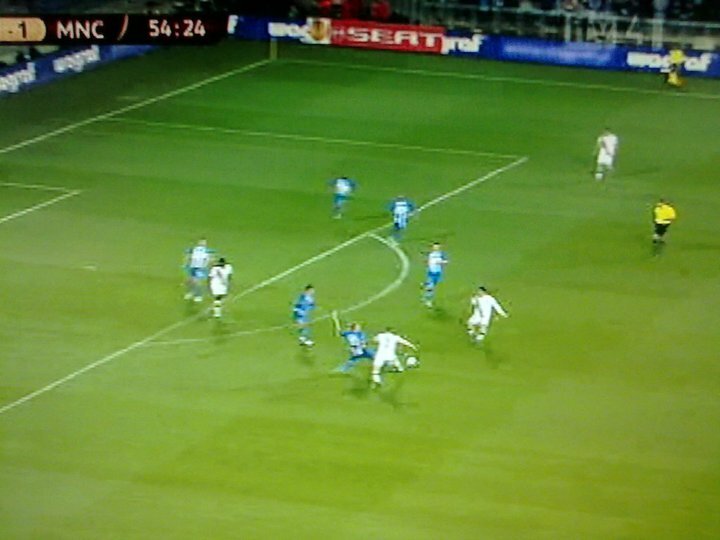 Poznan’s first goal came from a series of poor headers. Joleon Lescott heads it straight up into the air, Zabaleta and Vieira both go for the dropping ball it bounces off one of them straight to Dimitrije Injac who hits a sweet shot into the net. At half-time, Wright-Phillips was substituted for David Silva, who took up Milner’s position in the centre while he moved left. The nimble playmaker encouraged many interesting moves around the box and appeared to cause Adebayor becoming more fluid in the second half, with him taking up positions deeper or on the flanks. This also meant that Man City now lost their reference point up front, meaning they can’t put as many high balls into the box to worry Poznan’s deep defence. To further this point, Man City’s goal came mainly because of Adebayor’s height. A corner’s floated in, he rises above the defenders and heads it at the keeper before smashing in the rebound. Poznan, perhaps sensing that city’s back 6 weren’t comfortable on the ball, briefly pressed more, which resulted in them often winning the ball back high up the pitch, trapping City around their box for long periods of the second half. However, this also meant giving up another part of the pitch like City had done – the difference is that no Man City player took adavantage of the space. 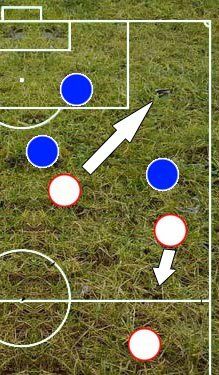 For example, in figure 4 David Silva picks up the ball wanting to hit it into the space but no one is making the simple run marked out with the arrow, instead he’s forced to turn and give it to the wide player. At 1-1, Man City were 3 points clear at the top of Group A. Roberto Mancini decided a point was enough and decided to shore up the heavily under-pressure defence by bringing on Vincent Kompany for Milner, switching Zabaleta to right midfield and Johnson to the left. It’s potentially a smart move – except for the English media, where it’s another sign of how unambitious Mancini is. It’s only a smart move, however, if he pulls it off; if not, it’s a shot in the foot. 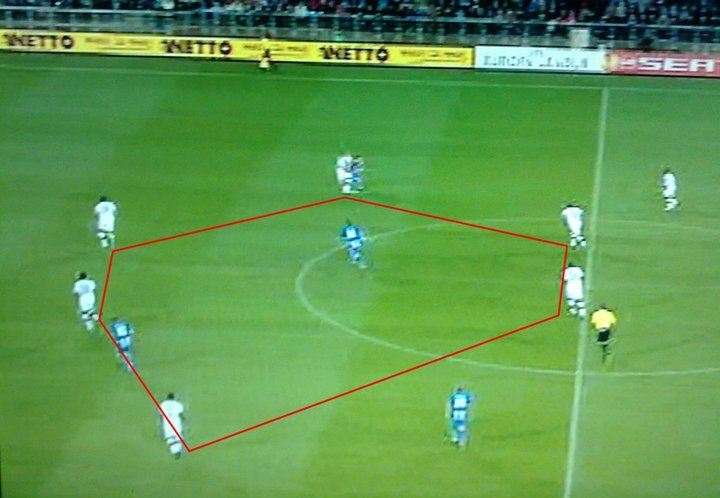 Unfortunately for Mancini, Poznan scored a rather freakish goal then a rather beautiful goal. You could raise some question marks over the poor clearing header or some of the defending for the other, but it’s essentially nitpicking, especially when there are larger issues. 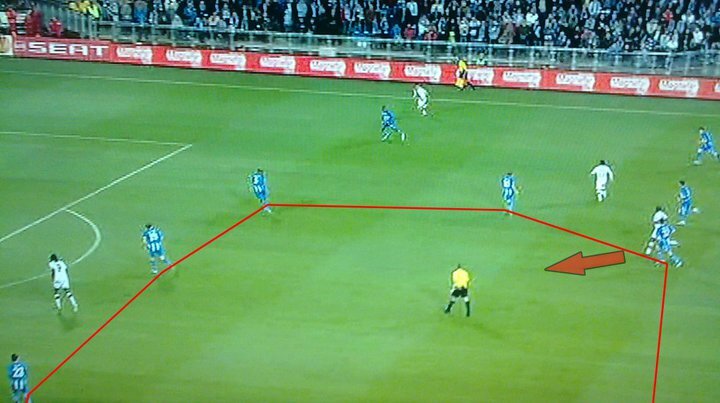 Poznan’s goals may have been fortunate, but they were only getting what their pressure deserved. The players in the double pivot should not be playing in the same line like that.One of them should be playing the “second function” role and the other sitting deeper. As I said in your other article, their midfield is too easy to pass through. Yeah, Bolton were doing this well today from what I can recall – Muamba dropping deeper with Holden higher. Not entirely their fault but Vieira and Zabaleta were essentially doing absolutely nothing – offering nothing defensively or offensively. Ich weiÃŸ wirklich nicht. Sorry.